These links provide access to pages dedicated to the biographies of men who participated in the CCCs. These men gave to the Nation a preserved and accessible out doors for recreation, conservation and productivity. Farmlands were preserved, forests saved, inhabitable areas made liveable. In eight years a vast amount of work was done by these young men who spent six months to two years or more of the prime of their lives in spartan conditions laboring at the hardest type of work. Yet when their service of peace was done, they still had more to give to their country. 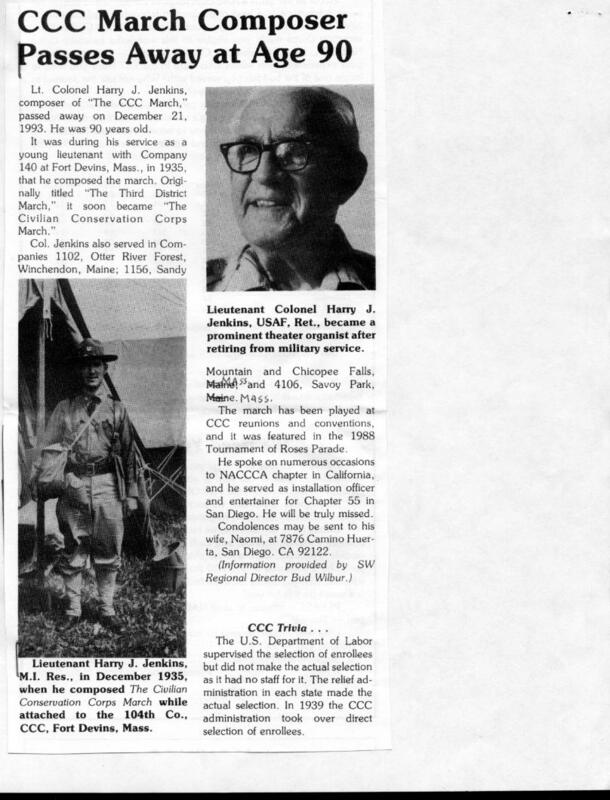 The CCC veterans provided the core of America's manpower and leadership in World War II, at home and at the fronts, and on into the years to come. The stories of these most productive of Americans are told below. Also herein will be the biographies of CCC staff members and Military men, who contributed needed leadership and guidance to the CCC men and their labors. Also the stories of other New Dealers, such as NYA or WPA persons whose contributions were just as important as the CCC story and add more depth to an understanding of that day and age. These pages tell their stories, stories from a more trying time, but a better time as well in many ways. Beyond these biographies, provided by family friends or the CCC men themselves, there are contained at the bottom of this page memorials to CCC Enrollees whose passings were noted on the internet. The Following are CCC members whose passing was noted from printed or online materials. For purposes of privacy, references to survivors are omitted. Suffice it to say that these men generally lived full family lives and were survived by spouses, children, grand children and great grand children. Elvin Bean, 74, died January 17, 1997 at the Talihina Veterans Center. he was born May 2, 1923 at Lebanon, Okla. where he lived most of his life. As a youth he worked for the Civilian Conservation Corps in Ardmore,Oklahoma from October 1939 to June 1941. he served with the U.S. Army during 1945 as a surgical technician, serving in England, France, Czechoslovakia, Luxembourg, Austria, Belgium, Holland, and Germany. During this time, he received the Good Conduct Medal, Silver Star, Purple Heart, EAME Service Ribbon, and the Silver Service Star. He married Bouneva COLSON December 24, 1947 at Gainesville, Texas. She preceded him in death on February 20, 1980. He was a member of the Mannsville United Methodist Church. Lawrence F. Bennett, passed Thursday, Mar 19, 1987, in Seattle. Mr. Bennett was born June 1, 1915, at Elwah. He graduated from Chemawa Indian School in Salem, Oregon and lettered in football, basketball, and baseball. He pursued all three sports following graduation. He had lived in LaPush, Queets and moved back to Port Angeles in 1957. Mr. Bennett had worked as a logger and fisherman and had worked in the Civilian Conservation Corps camps, as a fire watch for the Forest Service and was last employed by the Elwah tribe. Mr. Vincent "Vinnie" L. Collinson, 86, of 563 Hawkinson Ave. Galesburg, IL, died at 3:00 AM, Thursday August 10, 2000 at Knox County Nursing Home, Knoxville, IL. Graveside services will be 10:00 AM Monday August 14, 2000 at Wataga Cemetery, Wataga IL, Rev. Jill Vivroux will officiate. There will be no visitation. Memorials may be made to the American Lung Association. He was born on July 22, 1914 in Windmere ND. He married Eleanor Lawver in Galesburg IL. She preceded him in death. He then married Doris Pasco in Galesburg on December 1, 1979. (survivors omitted). He was an operator at Maytag for 30 years retiring in 1979. He also worked on the Suter Farms in the Wataga and Oneida (IL) area. He served his country in the Civilian Conservation Corps in Illinois. Millard (Jack) Cox, 58, of RD 5 Waynesburg (East View ) died Jan. 6, 1981. Born May 20, 1922, at Rogersville, he was a son of Walter and Bessie Shriver Cox. A life long resident of the Waynesburg area, he was a member of the First Church of the Nazarene of Waynesburg. He was a member of the Civilian Conservation Corps and a veteran of World War II having served with the U.S. Army in the Pacific Theater. During the Korean Conflict, he served with Co.K 110th Infantry, 28th Division. He was a member of the James Farrell Post 330 of the American Legion and the Veterans of Foreign Wars Post 4793. A former employee of the R.G. Johnson Construction Co. he was last employed by the Williamson Shaft Construction Co.
Andrew Jackson Craddock "Jack" Craddock, 74, of Beckley died September 17, 1998. He served in the Civilian Conservation Corps, was a Navy veteran of World War II, serving as a machinist, gunner and navigator, and took part in the raising of the flag on Iwo Jima. He was a heavy-equipment operator for Westmoreland Coal Co. with 30 years' service and a member of UMW, VFW Post 4326, Sophia-Midway, Eagles Aerie 3506, Moose Lodge 1606, Beckley, and Hollywood Missionary Baptist Church. Richard Burton Diehl, 95, of Pembroke, New Hampshire, on July 14, 1999. B.S. in forestry. From 1933 to 1942, he was a foreman with the Civilian Conservation Corps and worked in Vermont, Maine, and New Hampshire on fire prevention and training. He was instrumental in organizing fire districts and special deputy programs and retired as chief of forest fire control in the New Hampshire Division of Resources Development after 30 years of service. From University of Maine Alumni pages. Alvin Hanson, 87, of Bremerton died June 22, 1999, at Harrison Hospital. He was born May 10, 1912, in Hamar, N.D., to Alfred and Mabel Hanson. He attended school in Hamar, attending military school in the summer during high school and graduating in 1933. He also attended trade school for two years, studying electricity and radio technology. He also spent two years in the Civilian Conservation Corps during the Depression. In 1937 he and his family moved to Wenatchee, where Mr. Hanson worked in the fruit industry and for Wells and Wade Sheet Metal Shop. In 1941, they moved to Bremerton, where Mr. Hanson worked at Puget Sound Naval Shipyard and for the Coca-Cola Co. In 1949, he went into partnership, forming the Kitsap Vending Machine Co. The business was sold in 1969 to Interstate Vending Company of California. Mr. Hanson worked for that company in California until 1976, retiring to Bremerton. James Monk, was a member of Co. 349, Big Stone Gap, VA, according to an embroidered CCC souvenir pillow bearing his name and company. Lawrence McDermitt, 87, of Nitro died March 27, 2000. He was a retired frozen foods manager from Kroger Co., St. Albans, a graduate of Point Pleasant High School, a former member of the Civilian Conservation Corps, a member of the United Food and Commercial Workers Union, Charleston, and a Protestant. Evan W. Penry, 85, of Chillicothe, formerly of Delaware, passed away February 2000. Born July 6, 1914, he retired from Plumbers and Pipefitters Local #189 and lived the last 35 years in Chillicothe. Member of the Grand Council Royal and Select Masons of Ohio #84. 53 year member Humboldt Lodge #476- Gahanna, Royal Arch Masons of Ohio #54- Delaware, Knights Templar of Chillicothe #008, Order of Eastern Star Chapter #504- Delaware, U.S. Civilian Conservation Corps. Robert H. Sockey, Choctaw Robert H. Sockey (Bob Sockey), passed away January 3, 1989 near Bokoshe at the age of 73. He was born March 9, 1915 at Bokoshe, Oklahoma. He attended grade school at the Jones Academy Indian School, Hartshorne, Oklahoma. He attended High School at Panama, Oklahoma for two years before joining the Civilian Conservation Corps, Indian Division Five Civilized Tribes at Bull Hollow Camp, Oklahoma. He served with Company I of the 180th Infantry Regiment, 45th Division during World War II. He was very active in community affairs. John H. "Jack" Thompson, 83, of Belfair died Aug. 3, 1999, at Northwoods Lodge in Silverdale. He was born June 10, 1916, in Gordon, Neb., to William and Dellrue (Jordan) Thompson. He was raised in Nebraska. (survivors omitted). Mr. Thompson joined the Civilian Conservation Corps in 1933 in Pierre, S.D. He came to Washington in 1941, and worked for the Bremerton Police Department. He was a carpenter by trade and later worked at Puget Sound Naval Shipyard for many years before retiring. He was a member of Belfair Community Baptist Church and was one of the first volunteer firefighters in Belfair. He also was a 47-year member and honorary past master of the Union City Masonic Lodge 27 in Valley Junction. Joseph Billips Wiles, 81, of Rustburg, passed Friday, July 23, 1999 in Lynchburg. Joseph (J.B.) Wiles was born Dec. 1, 1917 in Seneca to the late Harriet Poindexter Wiles and Thomas Alfred Wiles. (survivors omitted). J.B. joined the Civilian Conservation Corps when he was 16 and returned to graduate from Gladys High School. In 1942 he joined the Navy and served as a SeeBee in the pacific theater during World War II. J.B. has worked as a cost estimator in the space and nuclear industries at Cape Canaveral, Fla. and Jackass Flats, Nevada. J.B. throughout his life, was an intelligent and interesting man. From his youth in Lynchburg, where he earned the nickname of Red Wiles, to his retirement at the age of 77, he exerted a powerful influence on those who had the privilege of knowing him. J.B. was a man who loved and was loved by many. He will be sorely missed.